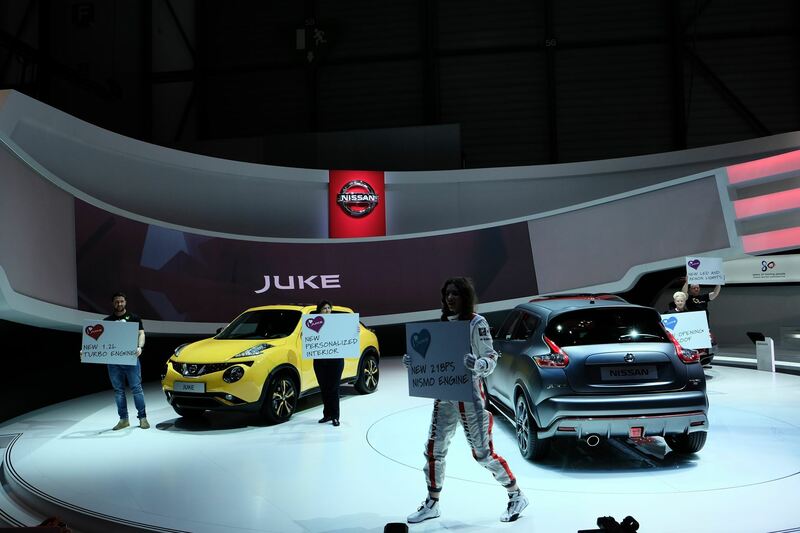 Following the addition of the new JUKE NISMO model in mid-2013, Nissan’s popular JUKE sports crossover is now offered in a range of four exciting models – S, SV. SL and NISMO – each available in All-Wheel Drive or Front-Wheel Drive. Two new exterior colors, Red Alert and Bordeaux Black, are added for 2014, along with the continuation of the special Midnight Edition and Sport Package. The Midnight Edition features unique 17-inch Black Wheels, a Sapphire Black rear roof spoiler, Sapphire Black mirror caps and privacy glass. The Sport Package includes a body-color rear spoiler, 17-inch aluminum-alloy wheels and stainless steel exhaust finisher. A Navigation Package is also available. 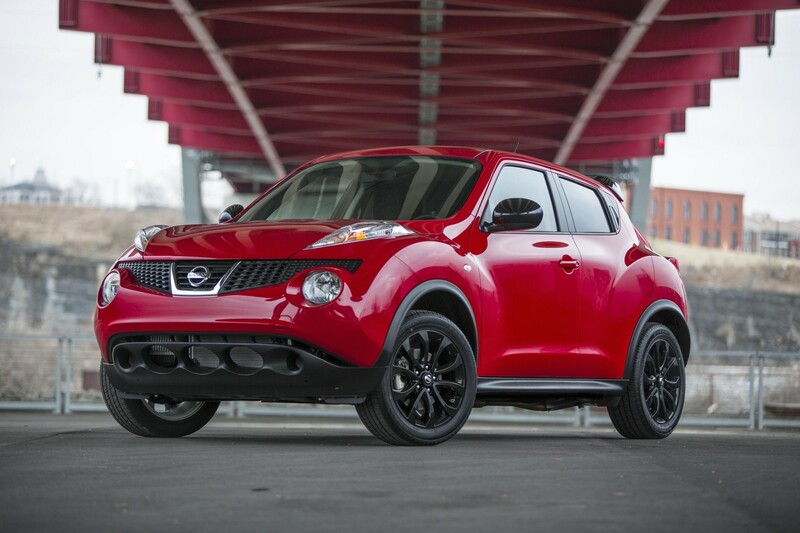 The JUKE NISMO features nearly 100 individual revised components, including a NISMO-tuned 197-horsepower 1.6-liter DIG turbo engine, NISMO-tuned suspension, bold aerodynamic styling, deeply bolstered front seats, red accents and lightweight 18-inch aluminum-alloy wheels. For full information, please go to NissanNews.com. JUKE continues to build its reputation as one of the boldest designs and most spirited performers in the traditional B-segment hatchback field. Drawing its inspiration from a number of active lifestyle influences, including motorcycles and rally cars, JUKE features highly distinctive, sporty styling inside and out, along with unexpected levels of performance from a standard 188-horsepower 1.6-liter Direct Injection Gasoline (DIGTM) turbo 4-cylinder engine and an advanced torque vectoring all-wheel drive (AWD) system – performance technology usually reserved for premium vehicles. A Bold Urban Sport Cross JUKE again fuses the best qualities of a sports car, including a sporty driving position, dynamic handling and powerful turbo engine, with the best aspects of an SUV – such as a robust lower body, raised ground height, improved visibility, confident stance and available all-wheel drive. 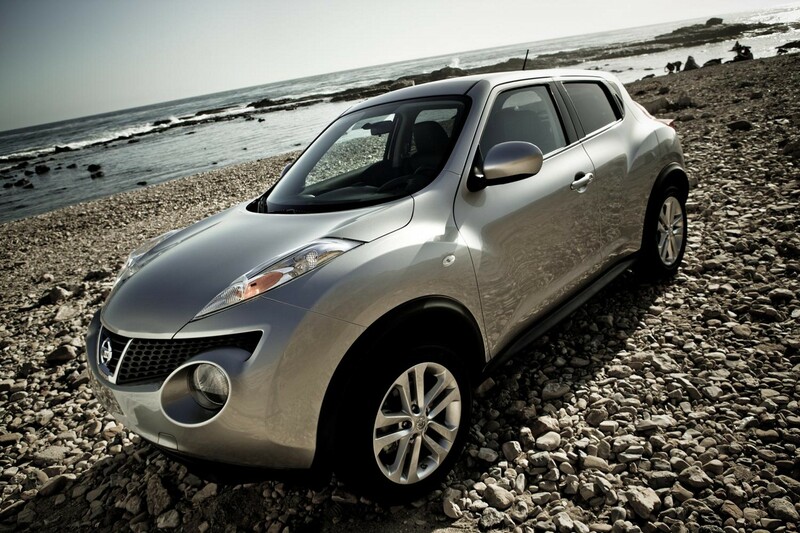 JUKE is built on Nissan’s proven global B-platform and offers generous ground clearance with standard 17-inch wheels and tires. 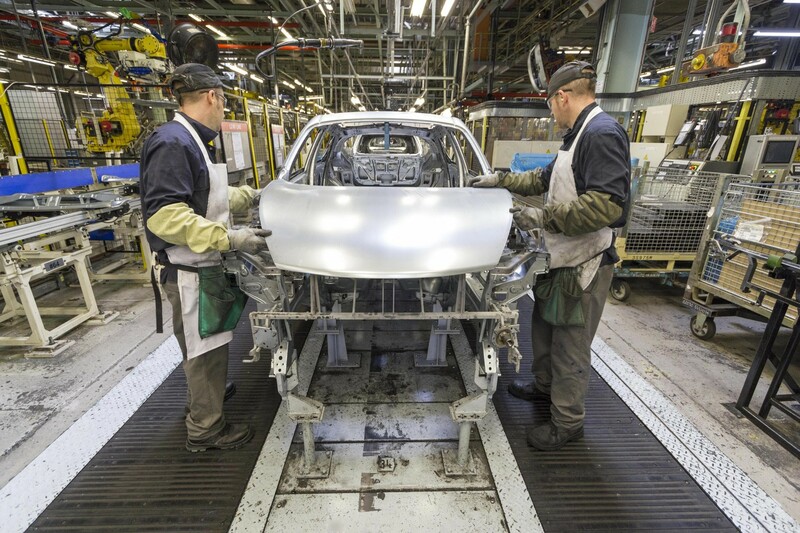 Adding to the authentic SUV look is a broad shoulder line, large wheel arches and robust lower bodywork that seems to emerge from under the vehicle. The sporty, powerful front end is highlighted by the unique light treatment – with the headlight split into two distinct elements. The main lamps draw inspiration from rally car lights and the turn signals are integrated into the front fenders. Fog lights are available depending on trim level. 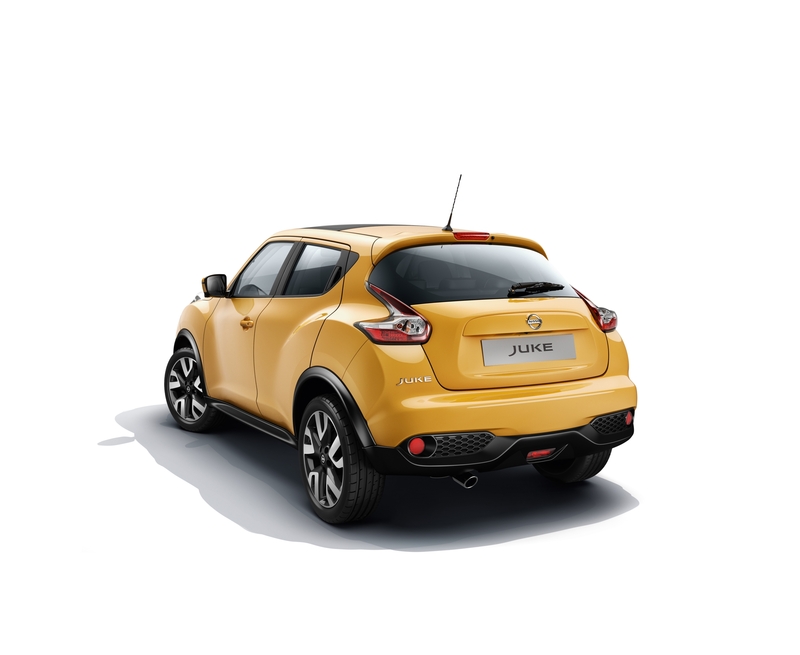 JUKE also shows its sporty side with a raked windshield, upswept rear side windows, canopy-like glass, a high beltline and coupe-like falling roofline. Other exterior details include body-colored outside mirrors and front door handles, and “hidden” rear door handles. In the rear, the taillights share a resemblance with the distinctive “boomerang” design found on the latest generation Nissan 370Z. 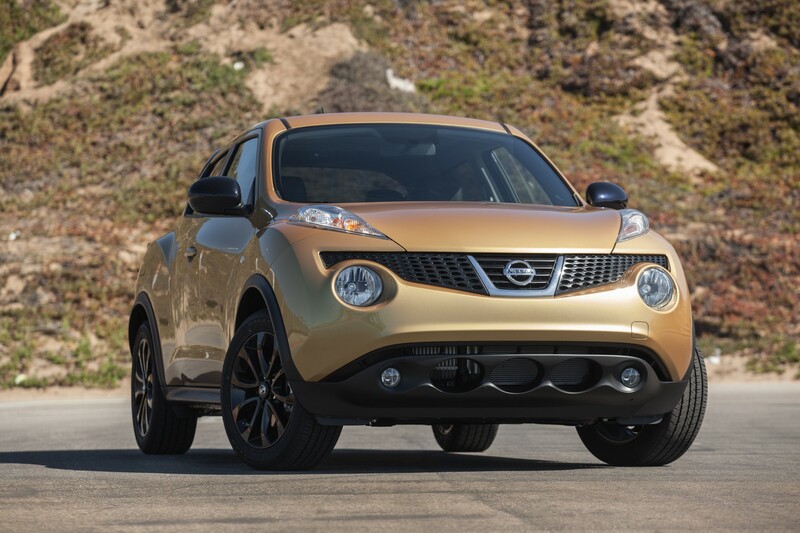 The JUKE color palette includes a range of nine exterior offerings: Sapphire Black, Gun Metallic, Cayenne Red, Graphite Blue, Atomic Gold, Brilliant Silver, Pearl White and new Red Alert, Bordeaux Black. 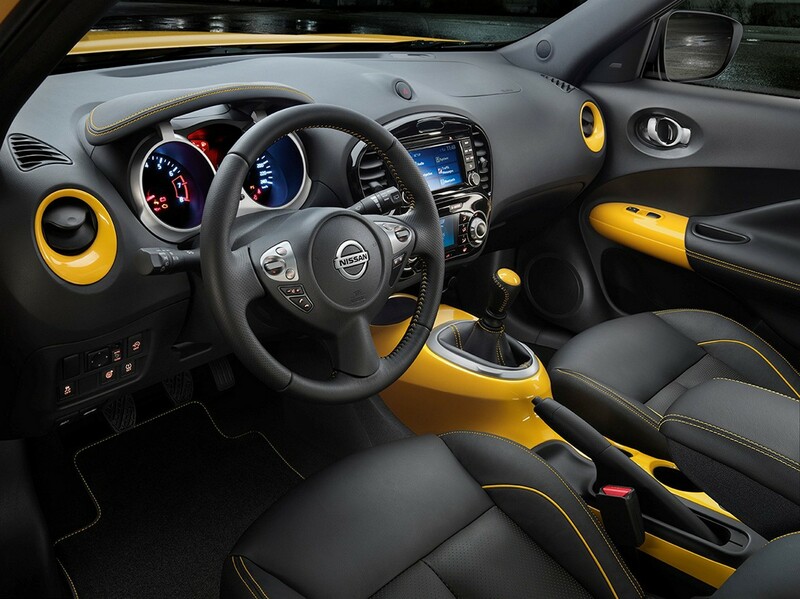 Inside, JUKE’s interior is equally aggressive with bolstered front seats, a wide instrument panel and a unique center console inspired by a motorcycle fuel tank and finished in a high-gloss paint. The gearshift sits on top of the console, inspired by sports car driver/shifter positioning. 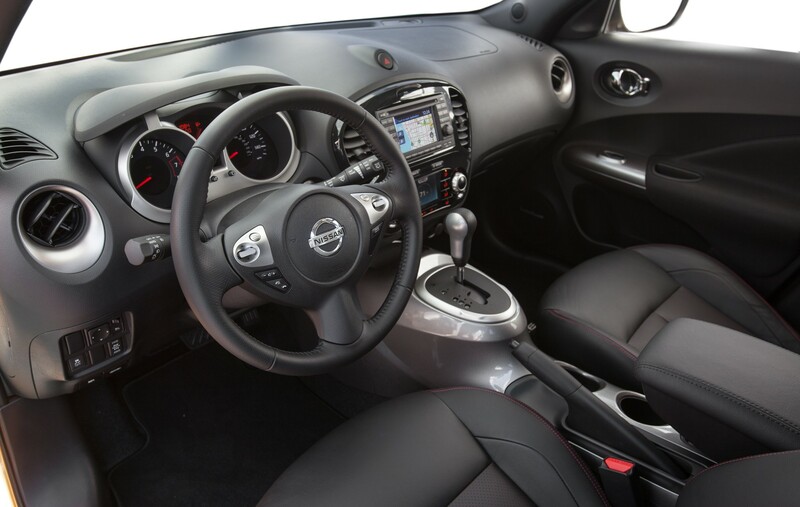 Another unique element of the JUKE interior is the Integrated Control (I-CON) system drive mode selector, which offers three different throttle/transmission/steering response settings – Normal for everyday driving, Sport for a more intense performance feel and Eco for maximum efficiency. It adjusts throttle, transmission (CVT only) and steering feel for the precise performance the driver desires. I-CON also serves as a central command center and display module, adopting different display colors and functions depending on how it is being used. In Climate mode, the display shows the interior temperature settings while the “buttons” display air flow preferences. In “D-Mode,” the buttons change to the three driving modes and the display shows engine- and drive-related dials and information. Among the long list of standard JUKE interior features are a 6-way manual driver’s seat and 4-way manual front passenger seat, dual front and rear beverage holders, speed-sensitive automatic door locks, storage under the rear cargo floor (FWD models only), Bluetooth® Hands-free Phone System, Interface System for iPod®, and AM/FM/CD audio system with steering wheel controls. A Rockford Fosgate ecoPUNCH™ audio system is standard on SL models and available with the SV Navigation Package. Available interior features include premium cloth fabrics, leather-appointed seats, heated front seats, RearView Monitor, Nissan Intelligent Key® with Push Button Ignition, SiriusXM Satellite Radio (SiriusXM subscription required, sold separately), USB connector for iPod® and other devices, power-sliding moonroof and privacy glass. Also available is the Nissan Navigation System 5.0-inch screen and NavTraffic with Real-Time Traffic Information (SiriusXM subscription required, sold separately). Three interior color treatments are offered: Black, Gray and Black/Red. 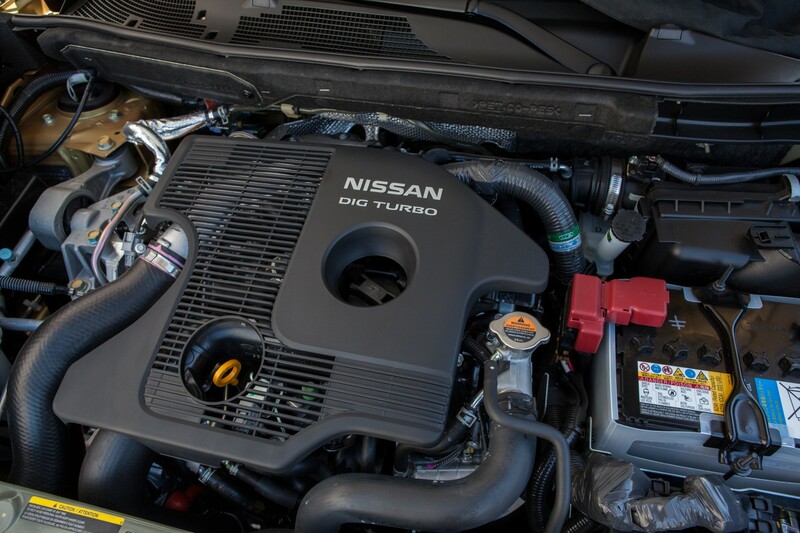 An Advanced Drivetrain Powering the 2014 JUKE is a standard 1.6-liter Direct Injection Gasoline (DIGÔ) turbo, 16-valve DOHC aluminum-alloy inline 4-cylinder engine rated at 188 horsepower and 177 lb-ft of torque. The engine combines spirited performance and good fuel economy. Direct injection helps improve combustion, enhancing power, torque, economy and emissions. The use of the turbocharger and intercooler also help boost power, while the variable timing control for both intake and exhaust cycles improves low-end engine response. Two transmissions are offered – Nissan’s advanced Xtronic CVT® (Continuously Variable Transmission) with S-Mode and a 6-speed manual transmission (SV FWD model only). JUKE also carries the PUREDRIVE™ designation. 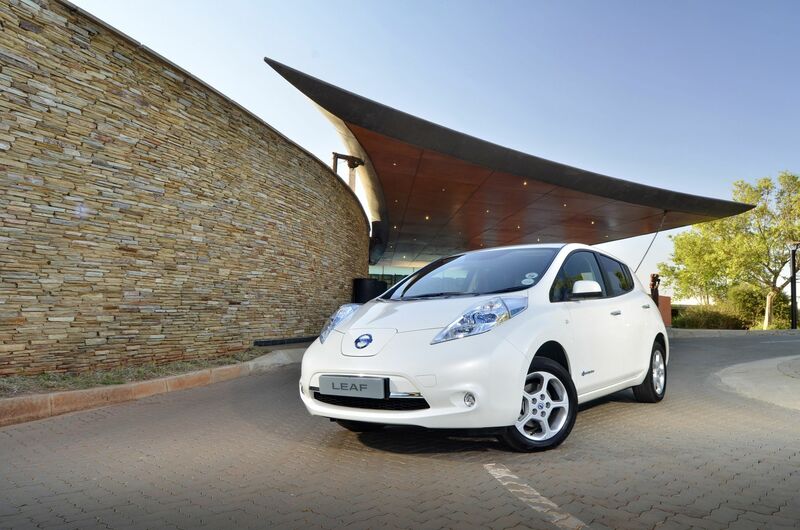 PUREDRIVE is used on models utilizing Nissan’s most advanced technologies to promote eco-friendly driving and lower CO2 emissions. 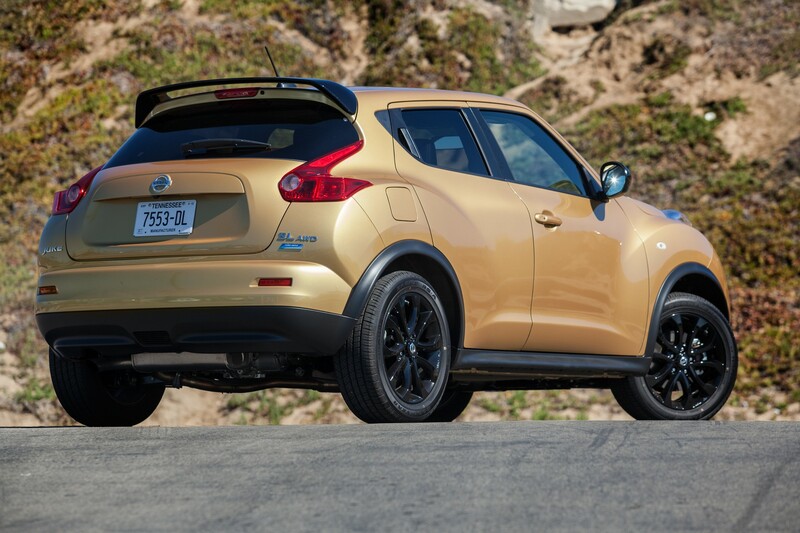 JUKE’s torque vectoring AWD system not only splits torque up to 50:50 between the front and rear wheels, it also can split torque from side-to-side across the rear axle. By monitoring vehicle speed, wheel speed, gear position, steering angle, lateral G forces and vehicle yaw rate, torque can be increased to the outside rear wheel in corners to help reduce understeer and enhance the car’s cornering feel. In total, up to 50 percent of the total available engine torque can be sent to either rear wheel. Also standard is vehicle-speed-sensing electric power-assisted steering. Braking is supplied by power-assisted 4-wheel disc brakes with Anti-lock Braking System (ABS) with Electronic Brake force Distribution (EBD) and Brake Assist. 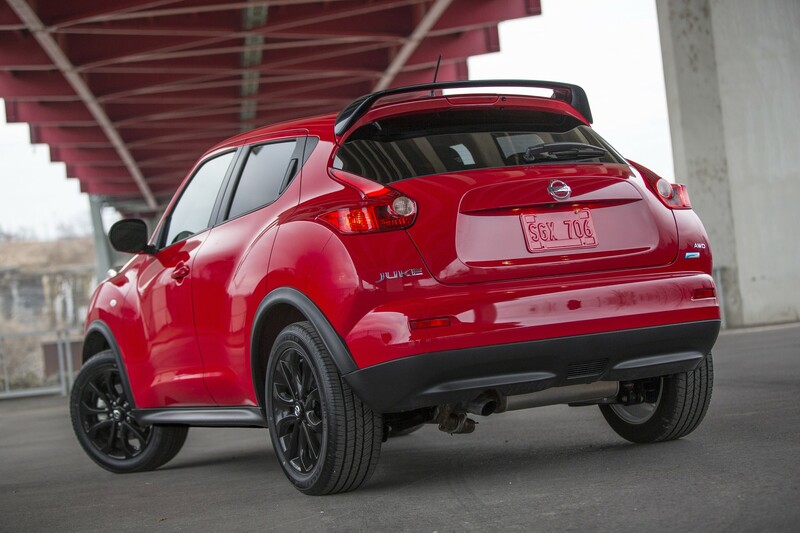 JUKE rides on 17-inch aluminum-alloy wheels with 215/55R17 all-season tires. Every JUKE comes equipped with the Nissan Advanced Air Bag System (AABS) with dual-stage, dual-threshold front air bags and seat belt and occupant classification sensors, roof-mounted curtain side-impact supplemental air bags for front and rear outboard occupant head protection, seat-mounted driver and front passenger side-impact supplemental air bags and front-seat Active Head Restraints. Other standard equipment includes LATCH (Lower Anchors and Tethers for CHildren) system, Nissan Vehicle Immobilizer System, Vehicle Security System (VSS), Tire Pressure Monitoring System (TPMS), Vehicle Dynamic Control (VDC) and Traction Control System (TCS). 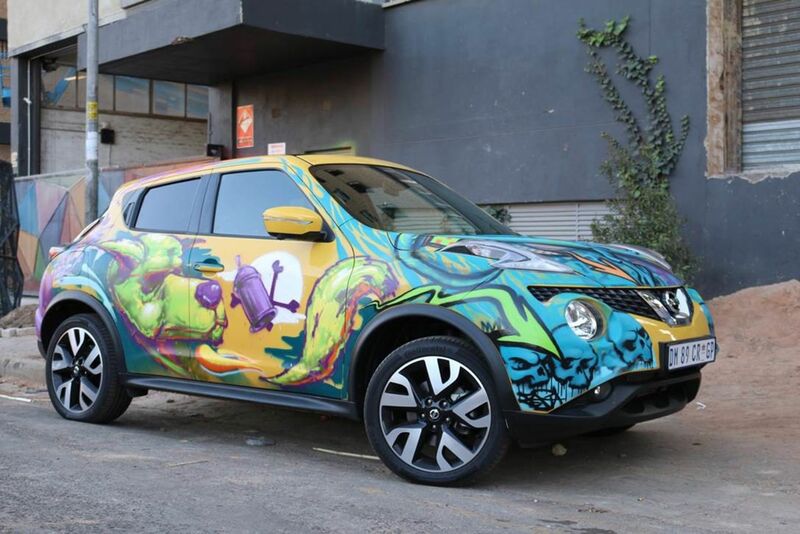 The 2014 Nissan JUKE sport cross is offered in seven well-equipped models: JUKE S CVT FWD, JUKE S CVT AWD, JUKE SV CVT FWD, JUKE SV M/T FWD, JUKE SV CVT AWD, JUKE SL CVT FWD, and JUKE SL CVT AWD – along with two JUKE NISMO models. Three option packages are offered – the Navigation Package, which includes a Nissan Navigation System with 5-inch color touch screen display and NavTraffic capability (SiriusXM subscription required, sold separately), Rockford Fosgate ecoPUNCH™, USB interface (iPod® compatible), and RearView Monitor; the Midnight Edition, with unique 17-inch Black Wheels, a Sapphire Black rear roof spoiler, Sapphire Black mirror caps and privacy glass; and the Sport Package, featuring a body-color rear spoiler, 17-inch aluminum-alloy wheels and stainless steel exhaust finisher.